Tiniest card yet – microSD, Spotlight search improvement, DeskLampX redux, clarification on virus protection on the Mac, James Kocsis Automator keyboard shortcuts tutorial, netvibes.com another web 2.0 home page, hype.non-standard.net for music podcasts (but is it stealing? ), kittenwar.com, shrink photos in Picasa, synergy2.sourceforge.net to share one keyboard between a Mac, a PC and a Linux box with separate monitors. It’s been a REALLY hectic week for me at work, I’m pretty good at handling a double-booked timeslot, but twice this week I was TRIPLE booked for meetings! One of those days I was supposed to be at Kyle’s high school registration and two other meetings, so I blew off work and went with Kyle to school. Speaking of my idiot son, he went to Six Flags this week and lost his phone on some right he called Tatsu. I’m a big rollercoaster hound, so I figure it was probably worth it, but that meant we had to go get him a new phone. Of course this is mid-cycle on the 2 year indentured servitude Verizon makes you sign up for, so there was very little in terms of subsidies, so this ended up costing me a fortune. I did opt (voluntarily) for a cooler phone than he was willing to settle for, because it had a MICRO SD slot so you could put music onto your phone and play MP3s. 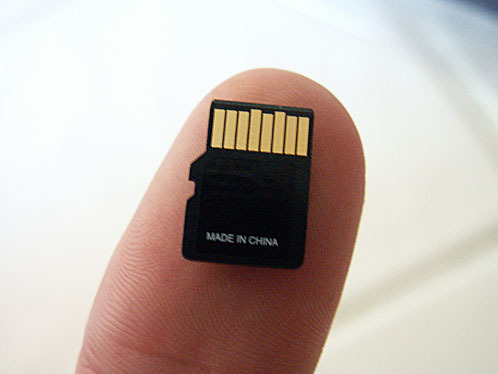 I wanted to do this because I wanted to see what a micro-SD card looked like, I’d seen mini-SD before, but not micro. We bought a 256 MB card for $25 at Circuit City and it looked like a regular SD card. I asked the lady about that, and she said, no, that’s the ADAPTER for the card so you can actually put it in a memory card reader, the micro-SD card is that tiny little thing you can barely see to the left of the SD adapter. I took a picture of it because I didn’t think you’d believe me – this darn thing quite a centimeter across! In the picture, it’s sitting on the end of his thumb, and in order to get up close enough to it I had to do a super macro that shows his actual figure prints! check out the picture in the shownotes. Listener Michael heard me talking about how I wish I could start a spotlight search in OSX from the part where you can define some filters to your search. turns out there IS a way to start there – just by hitting Command-F. That takes you straight in where I wanted! who woulda thought – command-F is the standard find command in all Mac applications! thanks Michael, I’ve started using it already! Last week I did a review of a shareware product called Desk Lamp for OSX spotlight searching enhancement. while there were some truly cool capabilities (especially the way it found and displayed search terms inside Apple Mail), I had a lot of problems with it crashing so I gave it a thumbs down. One thing I usually do is let the developers know if I review their tool, but I hesitate when i give a bad review. i decided to write to Alf Watt, the developer of Desk Lamp and let him know anyway. He wrote back within a few hours asking me for my crash logs and more info on what happened! I think this is awesome and the main reason I like shareware! If you had a problem with a huge commercial app like Word or iTunes, how long would it take you to get a response? It turned out I didn’t have any crash logs, which got me thinking. I reinstalled Desk Lamp and replicated some of the hangups I’d had, and took screen snapshots to send to Alf to show him how it got hung, including the force-quit window showing that it was not responding. While doing this it turned out Desk Lamp DID come back, so maybe it had never crashed at all before, just took a REALLY long time to respond. Not as bad as a crash, but certainly not what Alf had in mind I’m sure. In any case I look forward to new developments on this cool little app in the future, I’m sure Alf will be in touch as the product advances. listener Tim reminded me to remind you if you run WINDOWS on your Mac, you DO need virus protection (i said otherwise on the views from the Coop show). You have to run Windows update religiously, get a good antivirus and keep the definitions up to date, get several anti-spyware and anti-adware programs, and run them religiously as well. What I should have said was that you don’t have to run any anti-virus, spyware or adware software on OSX…yet. thanks for reminding me to be more clear Tim! On another note, great job on the Views from the Coop. Listening to you guys go back forth was comparable to sprinting then crawling, sprinting then crawling. It was a really funny dynamic that you guys had going on. It was amazing how quickly you were able to convert that one chick (a term I dont normally use) to buy a Mac in a matter of minutes. Im gonna start listening to that show just to see her husbands reaction!! It seems like everyone here at work is seriously thinking about getting a Mac as their next computer. Crazy especially since we only create Windows-only apps. Ive been on the Mac since the beginning and can honestly say that this is the most exciting time to be a Mac user. Even though James is CLEARLY a pest, I have to grudgingly admit that his tutorial is brilliant. Before I get into it, I do want to point out that I don’t think I single-handedly convince Kristi of Views from the Coop to switch to a Mac, I think I might have removed any final doubts she had about whether it was a good idea. She was balanced on the edge already, just needed one more vote in that direction! On to the tutorial. 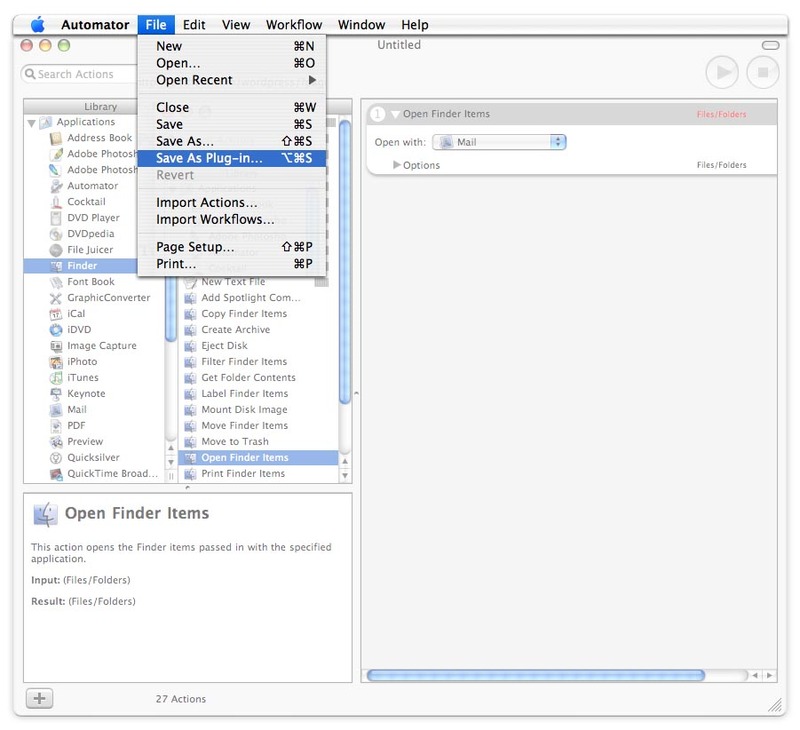 As I mentioned last week, I haven’t a clue how to use Automator, which is a built in scripting tool in Mac OSX. The main barrier to learning it was that I couldn’t figure out where it could help me. With James’ excellent instructions using a real life example where it could actually help, I think I might get the hang of this. Let’s walk through James’ tutorial, and remember just like everything else I talk about, the instructions are all in the show notes including some nice screen shots James provided. this is good enough that I will also post this in my permanent tutorials section in the sidebar on podfeet.com. I should mention that I edited Step 2 which will walk us through how to assign the keyboard shortcuts using a tool called Shortcuts. I got hung up during this part so I added a few extra instructions to help you out. My picture isn’t as elegant and his screen snapshots, but the step is important! Let’s dig in and learn some Automator! Ever want to create a keyboard shortcut for tasks you do multiple times a day? Here is a really simple way to do it. 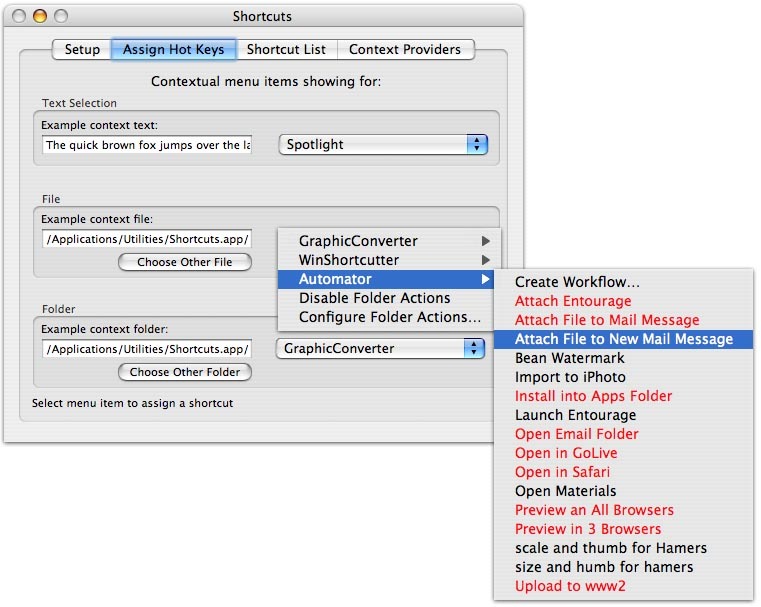 I use a combination of Automator and a utility called "Shortcuts" from: http://www.abracode.com/free/cmworkshop/. 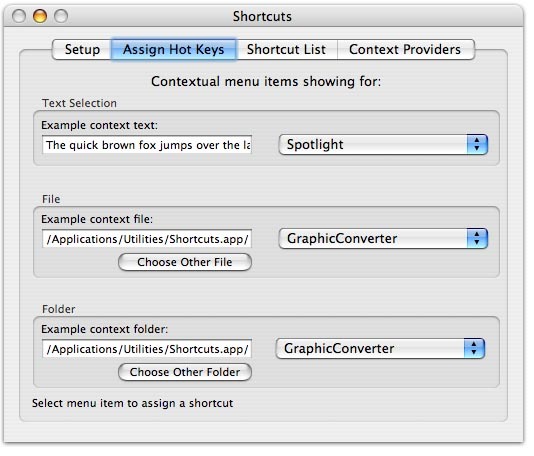 Shortcuts allows you to create keyboard shortcuts for contextual menu items in the Finder. 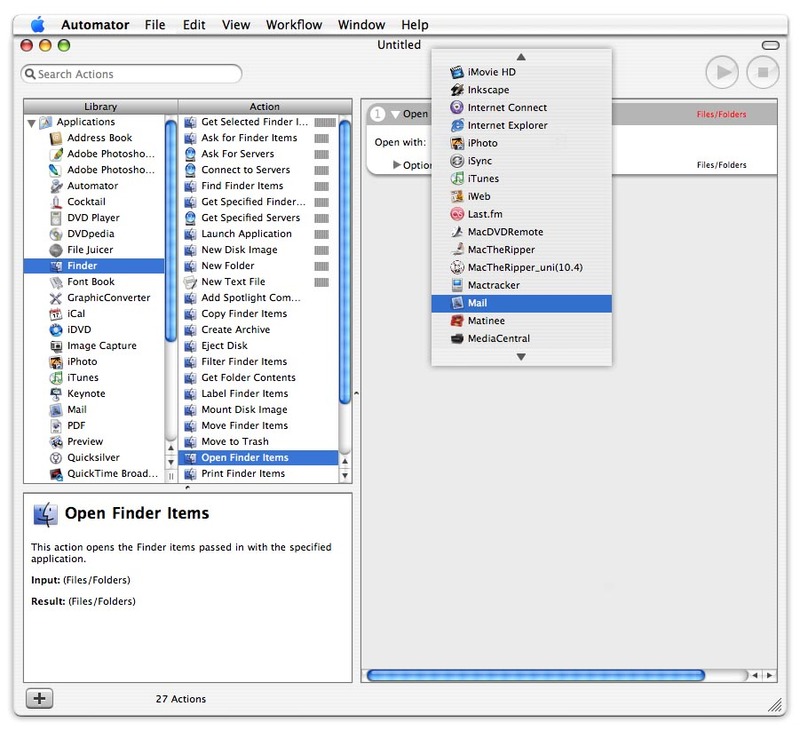 And with Automator, you can add actions to that contextual menu. In this example, we’ll create a keyboard shortcut that will attach a selected file to a new Mail message. This will eliminate the need to drag the file onto the Mail icon in the Dock or (god forbid) attach the document via a dialog box. Other uses can be: Quick upload of a file using Transmit, opening selected files specific applications (instead of having to right-click and wait for a list of apps to show up), or testing web pages in multiple browsers (instead of opening the file in each browser manually). I use this with TONS of workflows. It makes life bearable. In fact, between this and Quicksilver, I was able to COMPLETELY clear off my Dock (except for the Trash & Finder). Another reason to love the Mac. 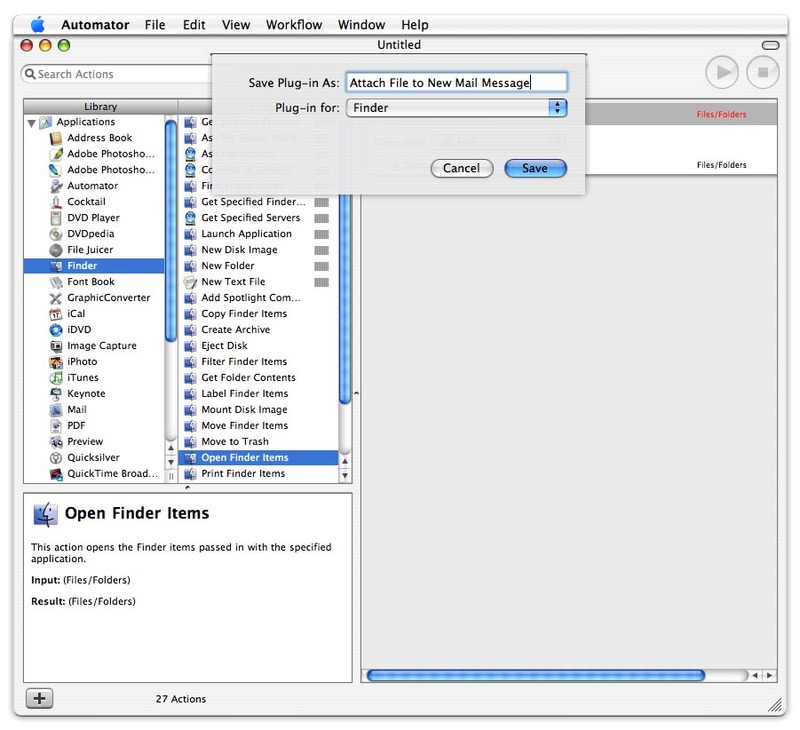 Step 1: Create an Automator Action to attach the selected file to a new Mail message. Under the "Library" column, click on "Finder" (Pic 1). 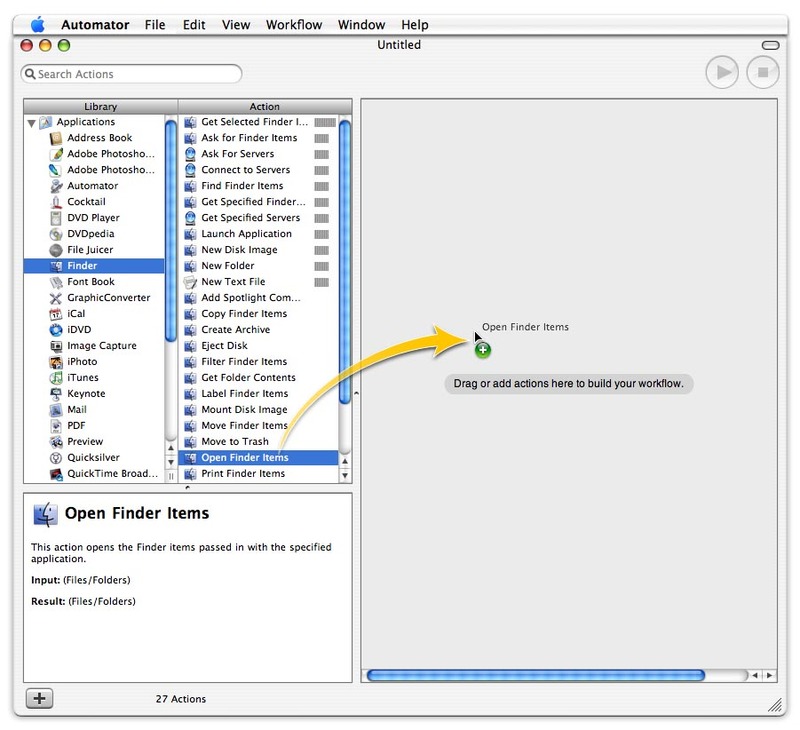 Under the "Action" column, drag "Open Finder Items" over to the workflow pane on the right(Pic 1). Select "Mail" from the dropdown menu (Pic 2). From the "File" menu, choose "Save As Plug-In…" (Pic 3). Give it a name like "Attach File to Mail Message" and leave the "Plug-In for" menu set to "Finder" (Pic 4). 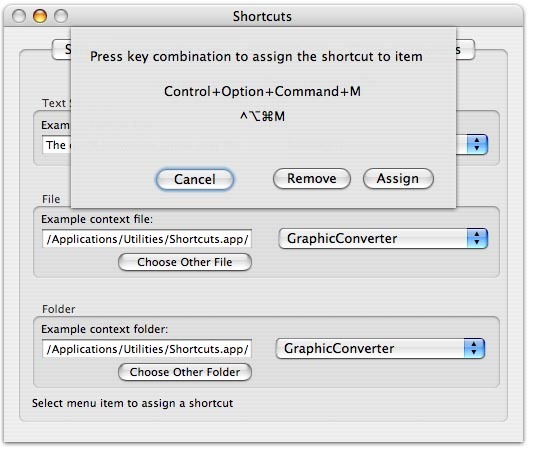 Step 2: Create a keyboard shortcut for the action you just created. Click the "Setup" Tab and click the three buttons labeled "Start", "Add", and "Install&quot. 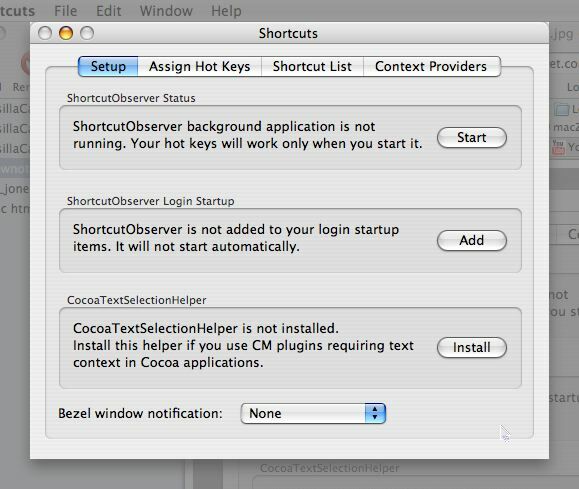 This will Start the ShortcutObserver so your shortcut will work in this session, Add the ShortcutObserver to your login startup items so your shortcut will work every time you login, and Install the CocoaTextSelectionHelper which assists in text selection (Pic 5a). Click the "Assign Hot Keys" Tab (Pic 5b). Under the "File" section, select the action you just created from the pulldown menu (it will be in the Automator fly-out menu) (Pic 6). A sheet will drop down asking you to type in the keyboard shortcut you’d like to use. Type in the key combo. Make sure it doesn’t conflict with any other key combos in the Finder (Pic 7). Go to the finder, highlight a file, hit the keyboard shortcut you created. Watch as Mail launches and attaches your file to a new message. Pat yourself on the back. You now rock as hard as me. Congratulations. Thanks for hosting this tutorial Allison!! You are a true goddess. Thank you James for teaching me this, I think I’ll get over my fear of Automator now and really dig in! On to Will’s other idea, he suggested we check out netvibes.com. Graphically it looks a lot like Bitacle, a pleasing blue color to the sections. The first thing I did was tailor the gmail window for my account, and it pulled all of my emails, unlike Bitacle which wouldn’t connect. However, when I click on the emails, it brings up a big banner for google chat and asks me to log into my Gmail account. I did it, and while it didn’t launch google chat which was a relief, it just took me into my email. Not a big benefit there, the double login doesn’t make sense and I could have launched it myself. One of the pre-stocked sections (they’re not called bits or flakes, wonder what I should call them?) is a web search window that’s excellent. It has little tabs for google, yahoo, icerocket and wikipedia. nice to have them all right there, easy to switch between them. Deleting sections is a snap, but it asks you to confirm which is unnecessary as they’re so easy to put back. I quickly figured out that a quick carriage return got rid of the warning so it was less annoying. time to add more content – when I added a new section, it drew a red box around where I was placing it before i let go, which was kind of nice, you can tell what’s going to happen before you commit. On the top banner of each section they are icons for several things that show up when you hover over it – “publish on netvibes ecosystem”, refresh, edit, and close, along with the name of the section and a number if it’s an RSS or email listing. that’s all handy, but it caused a problem when my window was narrowed because there was no free space in the title bar for me to grab the section to move it! I kept getting it to pop up and ask me if I wanted to add it to the eco system, or whether I wanted to publish it to another website and all kinds of stuff. I got distracted after I added the flickr photos section – it’s everyone’s favorite tagged photos – so cool! Okay, back to work! As you hover over each new content choice, a nice little box flicks up to tell you about that particular item. They have tons of things you can add, from box.net to fox sport video, to iCal viewer to Ebay – the list goes on and on! Oops, got distracted again, they had AOL Radio, which i’ve talked about before, but this one takes you to music videos, and the first one listed was John Mayer, and I’m a sucker for him! Found myself over on music.aol.com watching him sing! I really think AOL is reinventing itself so well with this line of music distribution. Back to Netvibes. I created a new tab by hitting uh…new tab, and it let me rename it. I called it mail and stuff, and I wondered if I could just drag my gmail onto that tab and it would automatically move over there, and it did! VERY nice! they also let you name the home page. I REALLY like the way they integrated RSS feeds in. I was able to add the NosillaCast feed, and it gave me a short listing of the feeds, and if I click on one it brings up another window inside the page (not a new browser window) and shows me all of them with the RSS text to the right. It even had a “listen” button which got me all excited, but then when i clicked it nothing happened so my thrill was short lived. Wonder why it didn’t do anything? The download button didn’t download, but it brought up the audio file inside my browser. The feed directory was pretty big, especially in the science and tech category, that was a complaint I had about bitacle, didn’t have enough content in there. The feed interface is very pleasing to the eye and intuitive. Whoops! got distracted AGAIN when i stumbled across a flickr memories site in the feed directory and saw some GORGEOUS shots of New York City at night. Highly photoshopped, but really cool! I put a link in the show notes. Based on how many times I wandered off task and started playing in Netvibes, I’d say that Will has given us a great suggestion for a nice Web 2.0 home page. Much better than Bitacle, and even stable! thanks for the suggestion Will! My niece Sara always has cool suggestions for me, and she came up with another interesting site. let’s say there’s a music you really like, and you wish they had a podcast. What if you could find everyone who’s playing anything by those artists and make it into a podcast? Enter Hype Machine, from hype.non-standard.net. Hype Machine’s FAQ says “the Hype Machine is an experiment (emphasis on experiment) that keeps track of songs and discussions posted on the best blogs about music. They track a variety of mp3 blogs, and if a post contains mp3 links it adds those links to a database. I tested out Hype Machine by typing in John Mayer, and I was shown a list of blogs that all had mp3s by John Mayer. I could click on Listen which would bring up a little flash player and just play the musice, or I could click on winamp, win media, or real player players. But the real magic is that there’s a button called Podcast. I clicked on that, told Firefox to open the pcast file it created with iTunes, and suddenly I’m downloading a podcast titled The Hype Machine – search results for John and Mayer. Now here’s the scary thing – the so called podcast episodes aren’t people talking about John Mayer, they’re high quality mp3 files of his songs! One was 128 kbps, and the next one was 192kbps stereo. So, how is this NOT stealing his music? On the Hype Machine website there’s a disclaimer that says “If you are an artist (or represent an artist) and are concerned about tracks appearing in our listings, you can find more information here and are welcome to contact us directly.” I clicked on the find more information link and read their copyright notice. They said that they support and respect the artists, writers, editors and producers who create original content and they they encourage users to enjoy legitimate downloadable media and to purchase music after sampling it online. then they go on to explain how they collect the material, and that they give full links to those who post material they collect including the authors of all postings, which I guess is their way of saying “if you have a problem contact them!” they also encourage anyone who feels their copyrights have been compromised to contact them and they’ll remove the link to that site. That all sounds good, and I’m not a lawyer, but it seems that when they go beyond just letting you listen online and let you download high quality audio recordings, it’s got to be stealing. I do think that it would probably stimulate interest in an artist, but I can’t figure out who would be motivated to buy a song on the iTunes music store when they already have i downloaded into their iTunes. I’d be curious to know what you think of this, am I off base here? am I just missing something? Hype Machine did get my curiosity up on this pcast file format. I found out that if you have a podcast you like, drag it from iTunes to your desktop and it creates a pcast file. You can now email or IM that file to someone and they drag it into THEIR iTunes, and then they’re subscribed! It’s a pretty cool trick, no idea how long it’s been around, but it’s pretty handy! now you can email all your friends your NosillaCast pcast file so everyone is happy! I hope no one thinks this website is in poor taste, but it’s called kittenwar.com. It’s not for everyone, but you really should go check it out. Okay, I just decided to try and make you worry – it’s actually a website where you vote on which kittens are the cutest! People upload their kitten pics, and then people set up “battles” between them in pairs. you can vote yourself, and you can also view the most winningest kittens. That’s mildly entertaining if you like adorable, fluffy little love balls. But the part I liked best was the losingest kittens. Good gracious there are some UGLY kittens out in the world! Last week I showed how to do a batch shrink of photos using iPhoto on the Mac, so you don’t have to wait forever to upload them to MySpace or to email them. 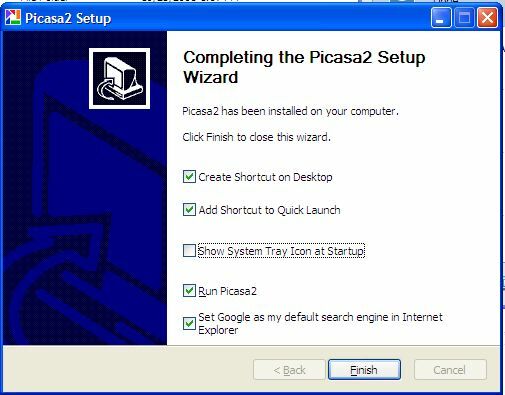 I promised I’d show a solution for windows, so I installed the free Picasa software from Google. If you haven’t already installed Picasa on your Windows machine, you really should check it out. It’s awesome. I did a full review in show number 24 on 1/2/2006 if you want to hear all about it. I figured if there’s a good program for shrinking photos, Picasa would be it. when I installed Picasa, I found one really interesting thing. You know how when you’re done installing software on Windows and the installer asks if it’s okay to put a shortcut on the desktop, in the start menu, in the task bar, in your kitchen sink…when Picasa gets to this point, it helpfully asks you if it’s okay to change your search engine in Internet Explorer to Google! Once I got Picasa installed, I let it scan my computer for photos. I found that there’s two ways to shrink photos as promised. One is to email them out and you can set the preferences in there to shrink them appropriately, or what we’re really looking for, which is to shrink and send to a new folder. Picasa didn’t have exactly what I was hoping for, where you could control the physical dimensions and the resolution in dots per inch. 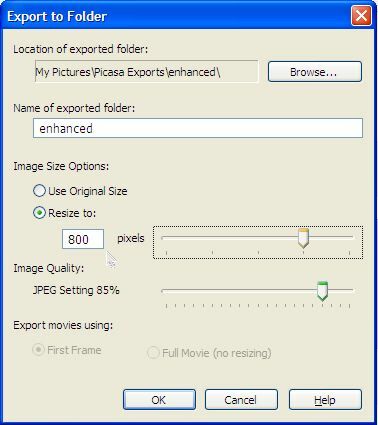 Instead they have a menu pick under File called Export, where you can choose to resize to a specific number of pixels. that’s a weird way of looking at it, I don’t know how many pixels are in a photo unless I sit down and do math! they have a slider for it, and you can change the jpeg image quality too. If anyone has a cool batch method of changing resolution that’s better than this, please drop me a line. I really thought Picasa would be the best way, but I’m betting someone out there knows a really good way to shrink up a photo to post online! I heard on Leo LaPorte’s radio show in Los Angeles that he uses a really cool open source tool to improve his productivity. He has a Mac and a PC sitting side by side with one monitor each, and he has one keyboard and mouse in the middle that he uses to control both computers. The software on each computer is called Synergy, and it allows him to seamlessly move his mouse between the two computers and control shifts automatically back and forth. Synergy is available from synergy2.sourceforge.net. I downloaded it on my son’s Mac and his PC, and for the life of me I couldn’t figure out how to get them to run! Believe it or not, the easy side was Windows – there’s was a nice little installer that created an application i could open and then configure. not sure what I was doing in the configuration, but at least it was a gui interface. On the Mac side they did the whole thing in UNIX, so they were blathering on about PATH names and telling me to type in commands like “synergys -f –config synergy.conf” and creating text files and all kinds of crazy geek stuff. I played around until I could successfully launch the program (from the command line) and get it to spit back “configuration file not found” and then I decided to go outside and play. For those of you with a higher geekness than me, enjoy synergy, I’ll be at the beach. that sounds like a good place to wind up this episode of the NosillaCast, this has been a great week for listener feedback, I love that, so keep up the good work, keep me honest and send me a note at allison@podfeet.com or drop me a voice recording at nosillacast@gmail.com. Thanks for listening, and stay subscribed. Chris – I forgot to get back to you on this! I noticed the same thing. It also doesn’t seem to work properly in Windows – iTunes says it can’t load the podcast, but if you click OK, it goes ahead and loads it!